With attention focused on unfolding trade wars and summer vacations, the release of the Bank of International Settlement (BIS) Annual Report garnered scant notice (with the exception of Gillian Tett's Thursday FT article, "Holiday Trading Lull Flashes Red for Financiers"). From the BIS: "It is now 10 years since the Great Financial Crisis (GFC) engulfed the world. At the time, following an unparalleled build-up of leverage among households and financial institutions, the world's financial system was on the brink of collapse. Thanks to central banks' concerted efforts and their accommodative stance, a repeat of the Great Depression was avoided. Since then, historically low, even negative, interest rates and unprecedentedly large central bank balance sheets have provided important support for the global economy and have contributed to the gradual convergence of inflation towards objectives." As we near the 10-year financial crisis anniversary, I would approach back slapping with caution. The key issue today is not whether central bank post-Bubble reflationary policies avoided a repeat of the Great Depression. Rather, did the unprecedented concerted - and protracted - global central bank response increase the likelihood of a more destabilizing future crisis - one where the dark forces of global depression might prove difficult to escape? I'm not interested in bashing the BIS. They strive to have a balanced approach. Yet reading through their insightful annual report it's apparent that major holes remain in the contemporary central banking analytical framework. To their Credit, they do recognize the unprecedented buildup of global debt and imbalances. In my view, however, they fail to appreciate how central bankers these days continue fighting the last war. One of the report's five sections discusses "The financial Sector: post-crisis adjustment and pressure points." The theme is the successful implementation of concerted measures to boost the safety and soundness of the global financial system through increased bank capital and liquidity buffers. There is some attention to "asset managers," but for the most part potential financial risks are viewed through a traditional lens. It's been my view, going back to 2009's aggressive reflationary measures, that central bankers failed to learn key lessons from the mortgage finance Bubble period. My biggest frustration revolved around the Fed's fateful decision to target mortgage Credit for system reflation - and then their complete neglect of prudent oversight of mortgage lending and mortgage-related financial intermediation, leverage and speculation. Indeed, they fashioned powerful incentives to borrowing, lend, build, speculate, leverage and intermediate risk - and then looked away. Even as a self-reinforcing boom took hold, the policy mindset fixated on the nineties crisis period and the view that the Fed must move quite cautiously in removing accommodative measures. When the mortgage boom overheated, the Fed remained too timid to risk removing the punchbowl. Worse yet, as the Bubble inflated the markets turned increasingly confident that the Fed would resort to unconventional measures. Over the past decade, global central bankers have incentivized risk-taking, speculation and leveraging in the securities and derivatives markets. Yet the so-called "macroprudential" focus has been on banking system capital, leverage and liquidity - fighting the last war. Ensure the securities and derivatives markets get all lathered up - and look away. BIS: "At least until recently, global financial conditions remained very easy. In fact, they loosened further even as US monetary policy proceeded along its very gradual and well anticipated normalisation path… Importantly, credit spreads have been unusually compressed, often at or even below pre-GFC levels, and the corresponding markets appear to have become increasingly illiquid. Moreover, for most of the year under review the US dollar depreciated, supporting buoyant financial conditions especially in EMEs, which post-crisis have borrowed heavily in that currency and during the past year saw strong portfolio inflows." The BIS report includes interesting data and charts. One of the more dramatic charts is "USD-denominated credit to EME non-bank borrowers," where EM dollar borrowings more than doubled since the crisis to a staggering $3.6 TN. "These trends mean the EMEs have become more exposed to an appreciation of the dollar and to reversals in international investors' risk appetite, as recent evens confirmed… Meanwhile, the greater participation of foreign investors in local currency markets compared with pre-crisis might not necessarily act as a stabilizing factor, as it may expose EMEs to a greater risk of capital flight." I saw no reference in the BIS report to "hedge funds," "carry trades," or leveraged speculation more generally. I would be much less concerned if I believed actual investors were on the other side of historic EM debt growth. For obvious reasons (i.e. their own data), the BIS doesn't partake in the fanciful notion of "deleveraging." "Public debt has risen to new peacetime highs in both advanced and emerging market economies." After ending 2007 at a problematic 179% of global GDP, debt over the next nine years rose to 217% of GDP. BIS data are broken into Advanced Economies and Emerging Economies. Not surprisingly, EM debt has led the charge during this cycle, having surged from 113% to 176% of GDP. No slouch, Advanced Economies debt has inflated from 233% to 266% of GDP. BIS: "In some countries largely spared by the GFC, for quite some time there have been signs of a build-up of financial imbalances. This is because, in contrast to countries at the heart of the turmoil, no private sector deleveraging has taken place, so that the financial expansion has continued. The signs of imbalances have taken the form of strong increases in private sector credit, often alongside similar increases in property prices - the tell-tale sign of the expansion phase of domestic financial cycles, qualitatively similar to those observed pre-crisis in the economies that subsequently ran into trouble." "Against this backdrop, a number of developments could lead to the materialisation of risks… In all of them, financial factors seem destined to play a prominent role, either as a trigger or as an amplifying mechanism. Indeed, the role of financial forces in business fluctuations has grown substantially since the early 1980s, when financial liberalisation took hold… One possible trigger of an economic slowdown or downturn could be an escalation of protectionist measures… A second possible trigger could be a sudden decompression of historically low bond yields or snapback in core sovereign market yields, notably in the United States… A third trigger could be a more general reversal in risk appetite…"
The BIS report includes an interesting section, "A Tightening Paradox?" BIS: "In fact, until at least the first quarter of 2018, no tightening of financial conditions accompanied the normalisation of US monetary policy; it was only well into the second quarter that any appreciable tightening was seen, particularly in EMEs… From December 2015, when the United States started tightening, until late May of this year, two-year US Treasury yields rose in line with higher policy rates… But the yield on the 10-year Treasury note increased by only around 70 bps, while very long-term yields traded sideways. Importantly, the S&P 500 surged by over 30%, and corporate credit spreads narrowed, in the high-yield segment by more than 250 bps. The Federal Reserve Bank of Chicago's National Financial Conditions Index (NFCI) trended down to a 24-year trough last year before rebounding slightly this year, in line with several other financial condition gauges." This section includes 12 separate bar charts comparing characteristics of the past three tightening periods, 1994/95, 2004/06 and "Current." To summarize, this cycle has seen the Fed raise rates less; bond yields generally rise less; stocks go up a lot more; high-yield spreads collapse like never before; investment-grade spreads narrow like never before; and local currency EM bond spreads collapse like never before. Perhaps most telling, the last chart shows $200 billion flowing into EM stocks and bonds during the current "tightening", up from about $40 billion and "NA" during the previous two cycles. BIS: "There are several possible reasons for monetary policy's limited impact on financial conditions. These include factors unrelated to the policy itself, large and growing central bank balance sheets outside the United States, and possibly the gradual and predictable nature of the normalisation… The large-scale asset purchase programmes of the major central banks outside the United States may have offset the impact of the Fed's monetary policy normalisation… Finally, the gradualism and predictability of the tightening may also have played a role. Gradualism is especially called for when there is high uncertainty about the economic context and monetary transmission, as currently. In such a situation, this can help avoid undesirable financial and economic responses. Yet a high degree of gradualism and predictability may also dilute the impact of policy tightening." "…Gradualism and predictability could induce search-for-yield and risk-taking behaviour, further compressing risk premia and boosting asset prices. Moreover, market participants could interpret gradualism and predictability as signalling that central banks wish to prevent sharp market moves, thereby providing implicit insurance for risky position-taking." And this finds us closing in on a critical issue: After years of straying down the path of manipulating market perceptions and prices, it has turned into a monumental challenge to get markets to return to even a semblance of normal (self-adjusting and correcting) operations. History repeats. Once the Fed targeted mortgage Credit for post-"tech" Bubble reflationary measures, markets correctly presumed the Federal Reserve would adopt a hands-off approach. 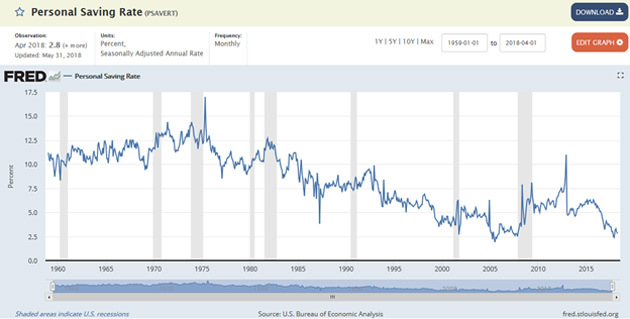 The Bubble would be left to inflate, with the Fed loath to risk popping a Bubble of its own creation - unwilling to quash progressively powerful asset market inflationary psychology. Markets for years now have presumed central bankers would not dare risk popping global securities and derivatives market Bubbles. After all, the Bernanke Fed (followed by Draghi, Kuroda and others) specifically targeted inflating securities markets for system reflation. The Fed's ultra-gradualist approach to "normalization" has only worked to confirm the markets' faith that these Bubbles could run indefinitely. Gradualism has again fanned increasingly powerful market inflationary psychology. In the process, global markets became one unprecedented playground for leveraged speculation. Fed funds - securities speculation funding costs - remains below 2% in the U.S., while short rates are near zero or below for much of the world. BIS: "The current backdrop for monetary policy normalisation is unprecedented in a number of important respects. Historically, interest rates in advanced economies, real and nominal, have never stayed this low for this long and central bank balance sheets have never swelled as large in peacetime. The long spell of multi-pronged policy accommodation may have left lasting marks on the macro-financial landscape, making policy effects harder to assess." With equities rising on the initial day of Trump Tariffs (and retaliation), market pundits were proclaiming trade war risk was "already baked into stock prices." Wishful thinking, to be sure. From my vantage point, it was just another payrolls rally. Occurring on the first Friday of the month/quarter, the payroll data often spark an unwind of options positions maturing two weeks later. The release of June jobs data corresponded with prospects for the first day of Trump Tariffs, ensuring ample hedging activity coming into Friday trading. And as the unwind of hedges spurred a market rally, pressure intensified on short positions more generally. The Goldman Sachs Most Short Index jumped (another) 1.4% Friday (up 3.4% for the week), again outperforming the general market. Betting against put buyers and short sellers has been a lucrative endeavor. But let's not mistake this speculative dynamic for sound fundamental underpinnings or healthy market behavior. Trade wars appear poised to unfold over coming weeks and months, if not years. President Trump has threatened $500 billion of tariffs if China retaliates. China's initial response was measured. The game of chicken has commenced, although speculative markets are content to see minimal short-term economic risk. Surely, cooler heads will prevail. Nothing crazy prior to the midterms. Meanwhile, Fed minutes presented a more hawkish FOMC, concerned by protectionist measures but increasingly focused on an overheated U.S. economy. Probably more interesting, there were some hawkish comments out of the ECB (Weidmann, Praet). This helped stabilize the euro (up 0.5%), with the weaker dollar spurring a relief rally in EM currencies, bonds and stocks. The rally in EM triggered the unwind of hedges and short covering in the U.S. and developed markets. It does not take a crazy imagination to envisage a global crisis beyond the scope of 2008/09. For one, Chinese and EM Bubbles barely missed a beat back then. A full-fledged global depression would require a synchronized global Bubble, replete with systematic Credit excess, economic maladjustment, and deeply systemic global imbalances. A backdrop conducive to fragility and crisis would include inflated asset markets on a global basis, policy-induced market misperceptions and egregious speculative excess. Well, it's all there. I never bought into the 2008 vs. 1929 comparisons. The next crisis, perhaps. If you think the risk of a debilitating trade war is high today, just wait until Bubbles start popping. And is it reasonable to anticipate that countries actively engaged in heated trade disputes will empower their central bankers to quietly go off somewhere and develop a master plan for rescuing markets and the global financial system? Will swap lines between the Fed and PBOC be politically tolerable? It is a much more complicated world today than back in 2008. We're approaching the 10-year anniversary of the "Great Financial Crisis." This fall will also be 20 years since the Russia/LTCM fiasco and the "committee to save the world." Too many committees, bailouts and reflations have nurtured just the backdrop for acute global financial, economic and geopolitical crisis. I wouldn't bet on central bankers being capable of maintaining control. Future historians might look back and identify this as a pivotal week. But will they appreciate that protectionism and trade wars are but a symptom? When will it be recognized that central banks are much more the problem than the solution? Wembley Stadium, London, 1996. Gareth Southgate gathers the ball, places it on the spot, then backs away. England’s central defender is taking a penalty kick during a shootout against Germany in the European Championship semi-final. He wants the ordeal over quickly. At the referee’s whistle, he sprints forward, kicking low and to the left. German keeper Andreas Köpke palms the ball away with ease. Southgate has only taken one penalty previously in a professional match. That one was also saved. This failure is decisive. England lose the shootout. The team would not win another in a major tournament for 22 years — until this week, when England, now led by Southgate as its manager, beat Colombia on penalties in the World Cup. They now move to the quarter-finals where they will face Sweden on Saturday. Southgate was born in 1970 to middle-class parents who lived in Crawley, West Sussex. In a working-class sport, he was considered a “posh boy” by teammates in the youth ranks at Crystal Palace, the London-based Premier League football club that he joined aged 14. His coaches from that time have suggested his contemporaries displayed more flair and talent, but less diligence and work ethic. After turning professional, he became a trustworthy, if unspectacular, centre back at Palace, Aston Villa and Middlesbrough. He played for his country 57 times, a disciplined defensive player his teammates could rely on. In 1996, he volunteered to take a penalty when many of England’s attacking stars shied away from the responsibility. These early experiences may have served him well during the frequent ignominies that befall football coaches. His reputation was damaged as manager of Middlesbrough, leading the side to relegation to the Championship, the second tier of English football, in 2009. He was fired shortly afterwards. In 2013, he was appointed manager of England’s under-21s, where he was able to work under less scrutiny than at a big club. There, he helped to enact a quiet revolution. In 2014, he was instrumental in an ambitious initiative by the Football Association, the national governing body for the sport, to transform the fortunes of the England team. The FA instituted the “England DNA” programme, training its youth teams to play the passing and progressive style of football expected of the senior squad. Players of all ages were to be coached on a set of shared principles. The approach was a response to England’s repeated failures at major tournaments. Other nations, such as Spain and Germany, have used their national youth systems to develop stylish and technically-gifted footballers who graduated into world champions. But the FA blinked when first asked to put the theory into practice. After the 2016 European Championships, when the England team plummeted to a historic low, losing to Iceland, Southgate was overlooked in favour of Sam Allardyce for the position of England manager. Allardyce, an experienced club coach, was considered a safer, battle-hardened choice. He lasted just one match in charge, before being caught in a newspaper sting, in which he appeared to advise undercover journalists on ways to circumvent the FA’s transfer rules. Allardyce denied wrongdoing, but resigned and Southgate was promoted to the top job. Expectations for success had never been lower. A bitterly disappointed football public had fallen out of love with the team. Quietly, Southgate continued the revolution. For this World Cup, he picked the least experienced squad since 2000, but one stacked with players who had played together in England’s youth ranks once under his guidance. He is transforming the English footballing DNA, enacting a fluid and complex 3-5-2 formation, and casting aside the decades-old reliance on simple but rigid 4-4-2. He encourages attacking play based around short, diagonal passes, rather than hoofing long balls forward and relying on bulldog spirit in defence. He has also broken with other dogmas. Past England teams have not systematically practised penalties before tournaments, believing it impossible to replicate the pressure of a shootout in a real match. Since March, the manager has had players simulating the lonely walk from the halfway line before a spot kick. Players have been advised to slow down and have faith they can execute a skill practised hundreds of times before. On Tuesday night, midfielder Eric Dier gathered the ball, placed it on the spot and backed away. As the referee blew his whistle, he waited a moment, steadied himself, then shot low and to the left. Colombian goalkeeper David Ospina brushed the ball with his fingers as it flew into the net. England had won its first ever shootout at a World Cup. On the sidelines, Southgate screamed with delight, as a personal and national hoodoo vanished into the Moscow night. The big are getting bigger. Disney has upped its bid for 21st Century Fox, off the back of pressure from Comcast, which wants Rupert Murdoch’s crown jewels for itself. T-Mobile and Sprint are pitching the Federal Communications Commission on a merger. In the wake of the US district court decision to allow AT&T and Time Warner to merge, the floodgates will be open to a host of new deals, many of which are desperate attempts by old-line companies to avoid having their lunches eaten by the real behemoths of today’s economy — the Silicon Valley giants. But the Faangs are under pressure, too. Regulators and politicians on both sides of the Atlantic are calling for a crackdown on their monopoly power. In the US, the Supreme Court last week ruled that online retailers can be required by states to collect sales tax, a reaction to the advantages that many virtual companies have wielded over the bricks and mortar kind. The court also announced that it would hear a case looking at whether Apple wields too much price control over apps. Meanwhile, the new chair of the Federal Trade Commission, Joseph Simons, has pledged “vigorous” antitrust enforcement, including hearings later this year on competition and consumer protection, the first since 1995. All of this reflects a major rethink about what constitutes monopoly power in America. The last time we had such a rethink was in 1978, when Robert Bork published The Antitrust Paradox. Bork held that the major goal of antitrust policy should be to promote “business efficiency”, which from the 1980s onwards came to be measured in consumer prices. It was a shift that took the US away from antitrust policy predicated on the welfare of the “citizen”, and one that clearly served the laissez-faire politics of the Reagan administration. But that definition is increasingly irrelevant in an age in which the most powerful companies in the world offer products and services for “free” in exchange for personal data. This has provoked calls for a return to the definition of monopoly in the 1890 Sherman Antitrust Act, which emphasises the need to ensure that the economic power of large companies does not result in the corruption of the political process. Critics of such a rethink — including most major tech firms — say that this would result in a weaponisation of antitrust. Consumer prices, they argue, are at least a set metric, whereas broader notions of economic power would themselves be more open to political manipulation. It is true that there are a number of Republicans — people who are typically uninterested in regulating big companies — who would be happy to break up platform tech firms like Amazon. This is not so much because they are worried about consumers or the concentration of power, but because they do not like the fact that Silicon Valley gives more money to Democrats than Republicans. On that score, it will be interesting to see whether the Department of Justice under Donald Trump will be as interested in breaking up Rupert Murdoch’s assets as they were in scuppering a deal by CNN’s parent company, Time Warner. But it is also worth remembering that antitrust has always been political. The AT&T and Time Warner merger, which displeased many liberals, was in many ways the result of the fact that the Obama administration was captured by Big Tech. Google practically set up camp in the White House, with a revolving door that makes the longstanding Goldman Sachs/Treasury shuffle look relatively minor by comparison. That is one reason the administration missed the rise of data markets and the way they would reshape the economy. The result is likely to be a raft of mergers that may give legacy players a few more years to duke it out against Amazon or Google, but will not do much to help consumers — or citizens. In an era of high corporate profits and declining trust in liberal democracy, I think that a return to Sherman-era principles would be a good thing. But that is a slow burn solution. In the short term, the systemic power of Big Tech makes me wonder if we should not start regulating platform technology as we regulate the largest financial institutions. Bank regulation expert Karen Petrou recently likened the largest Silicon Valley firms to systemically important financial institutions in terms of size, market impact, interconnectedness, and “substitutability”. It would be nearly impossible, she argues, to quickly replace one company with another in the case of a service failure. Major tech platforms have, according to Ms Petrou, “become so embedded in everyday life . . . that I think they flunk the substitutability test”. Big Tech sits in the middle of communications, media and advertising markets in the same way that big banks sit in the middle of financial markets. Just as the Federal Reserve can step in when structurally important financial institutions are both making markets and participating in them as traders or asset owners, so the FTC or FCC might do the same with Big Tech. Whether by antitrust policies, or by agency regulation, Silicon Valley’s economic and political power should be curbed, lest we fail a very costly stress test of democracy. LONDON – Nowadays, Britain’s words and actions on the world stage are so at odds with its values that one must wonder what has happened to the country. Since the June 2016 Brexit referendum, British foreign policy seems to have all but collapsed – and even to have disowned its past and its governing ideas. Worse, this has coincided with the emergence of US President Donald Trump’s erratic administration, which is pursuing goals that are completely detached from those of Britain – and of Europe generally. Trump’s abandonment of the Iran nuclear deal, combined with Russian President Vladimir Putin’s increasing belligerence and Chinese President Xi Jinping’s growing ambitions, indicates that the world is entering an ever-more confrontational and dangerous phase. 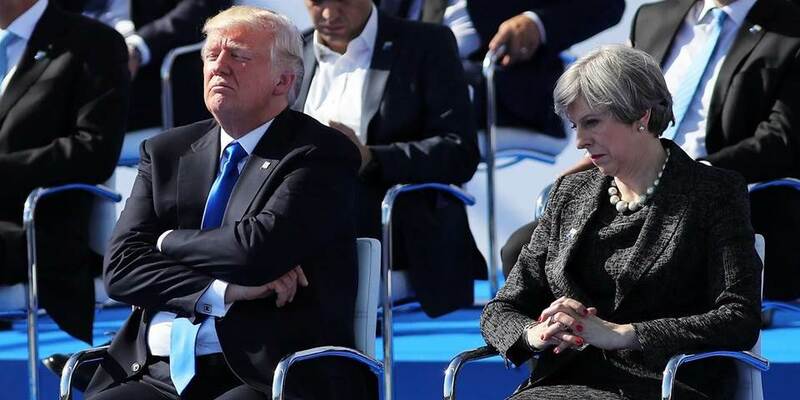 Trump’s evident lack of personal chemistry with British Prime Minister Theresa May – and the Anglophobia of his new national security adviser, John Bolton – ensured that this was never going to be the best of times for the United Kingdom. But it also doesn’t help that generations of British foreign-policy hands have regarded themselves as ancient Greeks to America’s Rome. To a Brit like myself, this analogy always seemed too confident. Having lived in America, I suspected that US leaders did not heed the advice of British diplomats nearly as much as those diplomats liked to think. Still, if ever there was a moment for Britain to sprinkle some of its characteristic calm and resolve over world affairs, that moment is now. And yet, the UK appears to have checked out. Since World War II, Britain’s close relationships with continental Europe and the US have served as the two anchors of its foreign policy. But now, both lines have essentially been severed. At the same time, the British government’s all-consuming preoccupation with untying the Gordian knot of Brexit has blinded it to what is happening in the rest of the world. And its blinkered view seems certain to persist. Negotiating the terms of Britain’s withdrawal from the European Union is likely to take years, and the outcome will inevitably have implications for the country’s unity, given the intractable issue of the Northern Irish border. Even if that issue can be sorted out, a campaign in Scotland to link it to the EU rather than to London will continue to command the attention of the government and civil service for the foreseeable future. At any rate, the promise of a “global Britain” freed from the chains of the EU was never more than idle talk and sloganeering. At the recent Commonwealth Heads of Government Meeting in London, business and political leaders from Commonwealth countries around the world heard plenty of Brexiteer bluster, but little concrete talk of future trade deals. A country like India could potentially be a major UK trade partner after Brexit. The problem is that Indians see Britain and Europe as one market. To them, Britain’s quest to adopt its own rules and standards amounts to a frivolous inconvenience. Before expanding trade and investment with Britain, India will most likely pursue a deeper relationship with the EU. Indeed, India never saw Britain as a particular champion of its interests inside the EU. Likewise, most of those outside of the “Leave” camp regard the Brexiteers’ aspiration for Britain to lead the vast “Anglosphere” into a brave new world as a comical delusion. To be sure, the show of US and European support after the nerve-agent attack on a former Russian spy and his daughter in Salisbury, England, might suggest that Britain is still punching above its weight. The coordinated expulsion of Russian spies from the EU and the United States was a victory for British diplomacy; and suspicions that the Russians were exploiting Britain’s increasing isolation seem to have mobilized NATO. But the larger truth is that the Russians are right: Britain is now Western Europe’s weak link. Thus, it is only a matter of time before Russian President Vladimir Putin probes British weakness again. And, as if the old sin of turning a blind eye to Russian oligarchs laundering money through the UK were not problematic enough, the suicidal act of quitting the EU leaves Britain with fewer tools to combat Russian meddling in its affairs. Britain is losing its influence over EU cybersecurity and energy policies just as cyber warfare and energy geopolitics are becoming key fronts for hostile state and non-state actors. Worse, at the same time that Britain is giving up its seat at the EU table, it also seems to be giving up its liberal-democratic values. During the Brexit referendum campaign, the Leave camp openly stoked hostility toward outsiders. And the recent “Windrush” scandal over the government’s poor treatment of Caribbean-born legal residents has reprised the illiberal legacy of May’s previous tenure at the Home Office. But equally insidious has been the government’s embrace of “Britain First” mercantilism, under which arms sales to Saudi Arabia are not a matter for caution, but rather an opportunity for profit. When the UK joins the Trump administration in putting trade and investment before human rights and good governance, it is journalists, opposition politicians, and human-rights activists around the world who bear the costs. By retreating from liberal norms, the May government has become, like the Trump administration, an enabler of authoritarian behaviors around the world. The collapse of British foreign policy has come at a time of deepening uncertainty. The global re-balancing between the US and China is a generational challenge that will outlast Trump and even Xi, who is now unbound by term limits. In an increasingly off-kilter world, the duty will fall to Europe to serve as ballast. But a Europe without Britain’s traditional leadership, judgment, and diplomacy will be a lesser Europe. And Britain, by its own hand, risks being reduced to a footnote. Mark Malloch-Brown, a former UN Deputy Secretary-General and British cabinet minister, is Chair of the Business and Sustainable Development Commission, and of Best for Britain, an organization fighting to keep the United Kingdom in the European Union. Armed police were called in to break up a rally held by disgruntled army vets over the weekend. Every reform creates winners and losers. But in the case of military overhauls, the losers sometimes command the loyalties of men with guns. More than a thousand veterans of China’s People’s Liberation Army from several provinces took to the streets in protest over the weekend in the Chinese city of Zhenjiang. The outpouring of discontent appears to have been triggered by an incident earlier in the week, when security personnel reportedly assaulted a veteran outside the local government office after he tried to submit a petition asking for greater pension and health care benefits for vets. By June 24, hundreds of armed police had arrived in the city and reportedly dispersed the rally without major incident. It’s doubtful that the issue has been resolved altogether. The Zhenjiang protests are just the latest bout of unrest involving disgruntled PLA vets. Since 2016, China has seen periodic protests by veterans, including a smaller demonstration in Henan province in May and, two weeks ago, a protest in Sichuan province sparked by rumors of another incident of police brutality against a veteran. Most notable, in February 2017, thousands of veterans staged a peaceful sit-in outside the headquarters of the Communist Party’s anti-corruption watchdog in Beijing – China’s largest protest by veterans since the founding of the People’s Republic of China in 1949. The initial protests compelled Beijing during its massive overhaul of the government this spring to launch a Ministry of Veterans Affairs to dole out benefits. But the problem facing Beijing isn’t of the sort that goes away with a quick bureaucratic fix. There are 57 million and counting ex-military personnel in China. In 2015, Chinese President Xi Jinping announced that the PLA would be cut by at least 300,000 troops by the end of 2017, shrinking the force to around 2 million troops. (The troop cuts are still a work in progress.) This was China’s 11th round of troop cuts in the past half-century. In 1980, the PLA was more than twice as large as it is now. When Xi took power in 2012, the PLA had become bloated and corrupt. (Two of the highest-profile tigers netted in Xi’s sweeping anti-corruption campaign were top generals previously seen as untouchable.) Xi’s goal has been to build a nimbler, higher-tech and depoliticized force that takes its marching orders solely from the Communist Party. Preceding the troop cuts, in 2013, Xi overhauled the PLA’s command structure, in part to break up deeply ingrained patronage networks and centralize Beijing’s control over the force. Xi also sidelined longstanding obstacles to a transfer of resources from the manpower-intensive army to the other increasingly important and expensive forces. China, of course, needs a PLA ready to fight, not to cash in on personal connections. Corruption, political risk and bureaucratic inertia in the military were acting as very real headwinds on China’s rise as a modern power. By most accounts, the reforms have been broadly popular with the rank and file and younger generations of officers, who see a more meritocratic path for advancement opening up and a more professional fighting force taking shape. In March, Beijing gave PLA personnel a hefty pay raise and backdated the bump by eight months. Notably, a circular issued earlier this month by the all-powerful Central Military Commission said that a yearslong process of phasing out profit-making contract work activities by the military will be completed by the end of this year. But the changes haven’t worked out for everyone – especially not for those who were cut. This terrifies the CPC leadership because a loyal PLA is the ultimate guarantor of its continued rule. If the PLA splits along factional lines, all hell breaks loose. This is partly why, in tandem with Xi’s PLA reforms, the CPC has been tightening control over the People’s Armed Police, a paramilitary force whose historical tasks have included preventing mutinies from within the military. It also speaks to the broader challenge in Beijing of balancing reforms that will inevitably work at cross purposes from time to time, particularly where those reforms risk at least an initial surge in unemployment. And China’s military and economic reforms have become somewhat intertwined. In 2015, the CPC tried to satiate those PLA personnel made redundant by nudging state-owned enterprises to offer preferential hiring to retired soldiers. (SOEs were already required to reserve at least 5 percent of their vacancies for veterans of the PLA.) Traditionally, Beijing has also asked local and provincial governments to shoulder the burden of ensuring that former service members received pensions and health care benefits. But most major Chinese SOEs are bloated, swimming in debt, and not designed to function as social safety nets on the government’s behalf. (They’ve increasingly been playing that role, however, as Beijing tries to cut back on industrial overcapacity, shut down high-polluting factories and carefully deflate real estate and credit bubbles without putting too many people out on the streets.) And some local governments are even worse off, carrying some $2.5 trillion in debt and few tools with which to raise funds. Local governments also have a long history of frustrating Beijing’s reforms; echoing complaints that have become common in veteran demonstrations, some protesters in Zhenjiang blamed local corruption for the lack of benefits. Meanwhile, China’s pension system is coming under increasing strain as China’s demographic crisis unfolds. According to the Chinese Academy of Sciences, the system’s surplus will sink into a deficit by 2023 and, by 2050, face a $118 trillion shortfall, absent major policy changes. So far, we have not seen any overt signs of instability within the PLA, and the riskiest phase of the reforms has already passed. Still, it tells us only so much that Xi could oust powerful generals protected by powerful members of the Politburo Standing Committee without sparking a backlash from those who had grown rich off their wide-ranging patronage networks. Keeping the grassroots content is an altogether different challenge – and one more likely to catch the CPC leadership off guard. Putting a dedicated agency in place to ensure veterans get what they’ve been promised can’t hurt. But there’s only so much money to go around. China’s looming economic crunch will make it increasingly difficult to paper over any cracks in the foundation underpinning CPC rule. For some context, Truman took office in the last few months of World War II, the deadliest and most expensive conflict in history. During that war, about 75% of America’s total economic output and expenditures were spent on the conflict, leaving only a quarter of the country’s GDP for all other activities. Investments in anything other than war bonds plummeted, and normal goods—from food and clothing to gasoline—were strictly rationed. Any extra rubber, paper, and metals acquired before the war were collected and given to the military. It’s no mystery why Americans retiring in the wake of “the war to end all wars” were less prepared than the previous generation. That’s not the case with the current generation of retirees whose savings rate has fallen over the last decades. The sad part is that while people’s hopes are increasingly pinned on Medicare and Social Security to help them stay afloat financially, just a few weeks ago, we saw official government warnings that those programs will be forced to reduce benefits by 2026 and 2034, respectively. Underfunded public- and private-sector pension funds add another level of pain. In short, we aren’t saving enough for our individual and collective retirements. This is borne out by the numbers, presented below in a graph by the Federal Reserve Bank of St. Louis. As an economist, I’m fascinated by any long-term change in human behavior. So what might be the reason for those individual and societal retirement deficits? Some analysts attribute the reduction in people’s savings to interest rates, which have dropped since the 1980s, but I don’t think that alone explains why people are failing to provide for their old age. Nominal interest rates don’t actually measure return on investment because they reflect and correct for inflation. Unlike previous generations, many people today are forced to support their parents much longer—often while helping their children too. Among financial planners, there is a saying, “Pay yourself first.” That means you should put money into your own savings before you spend on anything else. This is a great idea, but it may not be practical for most people. Longer lifespans, unique to our times, have made it more likely that working families will face pressures to help both parents and children. 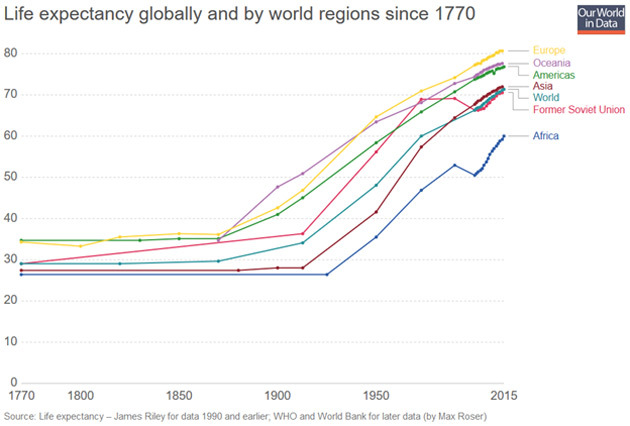 I’ll include only one chart, from Our World in Data, to illustrate the increases in life expectancy caused by the Industrial Revolution, which was promptly followed by a scientific one. Another reason why the financial and emotional burden of supporting older people has increased is that birthrates have fallen so precipitously in recent generations. And this is just one aspect of the retirement house of cards, a fragile debt structure maintained only by the assumption that something will happen down the road that makes everything better. Even if your own retirement is fully funded, you are not immune to the disruptions that will hit the entire economy when that house of cards collapses. I know a lot of people don’t believe it’s going to happen, but I’ve been here before. In the early 2000s, I was among the few contrarian economists cautioning that federal monetary policies were creating unsustainable mortgage and real estate bubbles. It wasn’t pleasant standing in opposition to the financial industry’s consensus that everything would be cool. Most journalists, politicians, and other financial analysts interpreted the warnings as political attacks. Some who predicted that things would end badly were accused of creating economic instability by undermining consumer confidence. Another difficult aspect for those predicting a downturn was that the bubble persisted longer than most people expected. Many people who heeded the warnings stayed on the sidelines while others profited from the ever-inflating bubbles. As a result, many of the “Cassandra” economists lost friends and clients. That changed, of course, when the bubble popped and economic growth went negative in 2007. When the dust had cleared, America’s household net worth crashed from over $65 trillion to less than $50 trillion, and the ranks of the jobless grew by 8 million. The S&P 500 lost more than half its value, ravaging the life savings of tens of millions of people who trusted the highly paid analysts of the mainstream financial industry. Too many investors who had been rich on paper found themselves in default or worse. El Jefe John Mauldin was one of the few prominent economists in the financial world who warned about the bubble. To this day, I meet people who tell me his advice saved them fortunes. Unfortunately, the mountain of Social Security and Medicare debt is much bigger than the mortgage and housing bubbles. When it collapses, and it will, the consequences will be much worse. Societal aging and the unwillingness to address it have been the biggest drivers behind deficit spending and debt in the developed world. Putting aside all ethical and legal issues, one fact remains: we’ve made promises that can’t be kept... and therefore won’t. Ironically, the only solution to the problems created by longer lifespans is even longer and healthier lifespans. If we can stay healthy and productive for most of our lives, individual wealth will increase significantly because we’ll have longer to earn and save. And because the most expensive diseases are age-related, healthcare costs will go down. By delaying or reversing old age, the old-age dependency ratio is repaired, budgets will be balanced and the debt paid off. This isn’t science fiction or wishful thinking. The biggest obstacle to a revolution in healthcare isn’t scientific—it’s political and psychological. Though more scientific breakthroughs are coming, they aren’t needed to fix the demographic problem. I’ve personally talked to scientists who calculate that if older people used optimal doses of vitamin D3, rapamycin, and a good multivitamin, it would increase healthspans enough to balance the federal budget within a few years. The next generation of anti-aging therapeutics will be even more effective. I’m sure of this, but I’m not sure when it will happen. Unfortunately, it seems to me that our institutions are once again in denial, as they were prior to the Great Recession. If this cloud has a silver lining, it is that many of us will live long enough to see the recovery when longer lives and other innovations create a new era of health and affluence.